WEST PALM BEACH, Fla. (AP) — Donald Trump’s campaign manager will not be prosecuted on a misdemeanor battery charge after prosecutors determined there wasn’t enough evidence to convict him of forcibly grabbing a female reporter. 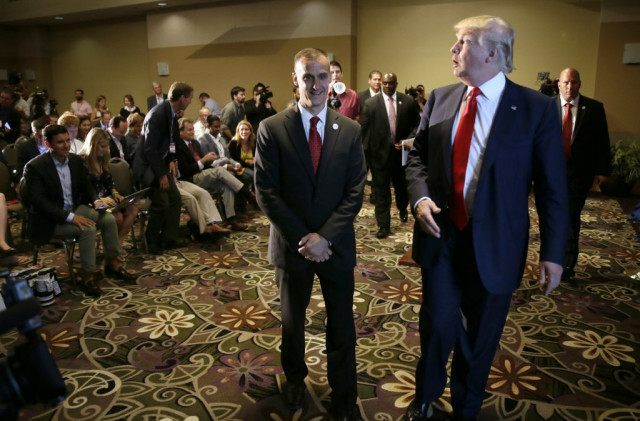 Police charged Corey Lewandowski last month after determining a video recording showed the New York City resident grabbing reporter Michelle Fields by the arm as she tried to ask the Republican presidential front-runner a question while he was leaving a campaign event March 8. State attorney Dave Aronberg said during a news conference Thursday that police were right to charge Lewandowski, but the burden on prosecutors to prove the case was higher. “Although there was probable cause to make an arrest, the evidence cannot prove all legally required elements of the crime alleged and is insufficient to support a criminal prosecution,” Aronberg said. Fields, who worked for the conservative Breitbart News website at the time, tweeted a photograph of her bruised forearm and said she had been yanked backward. Lewandowski had denied grabbing Fields and Trump had stood by him, rejecting calls by his opponents to fire him. Instead he went after Fields, accusing her of exaggerating and changing her story. The investigation proved, however, that Lewandowski “pulled Ms. Fields back” as she attempted to interview Trump, according to a memo by another prosecutor, Chief Assistant State Attorney Adrienne Ellis. The memo says that Lewandowski could have believed Fields was “making unwanted physical contact with Mr. Trump” that led him to pull her away. She quit Breitbart shortly after the altercation, saying its editors didn’t support her as they tried to maintain their relationship with Trump. Other Breitbart employees also quit. Aronberg said he had talked with Fields and she was disappointed he decided against pursuing the charge. The prosecutor also said Lewandowski could have signaled to Secret Service agents if he thought Fields was a threat, and he could’ve apologized. “In a case like this we do encourage an apology. Had an apology been given at the beginning of all this, we could have avoided the whole criminal justice process,” Aronberg said. The prosecutor’s announcement came days before the New York primary next Tuesday. Trump hopes New York marks an end to the worst period of his candidacy, a stretch that raised new questions about his policy chops and revealed his campaign’s lack of preparedness for a potential delegate fight if the GOP race heads to a contested convention. The prosecutor said he understood the case had garnered international attention, but the political climate did not affect his decision. Corrects earlier version that incorrectly identified Dave Aronberg as the spokesman for the state attorney.